Not much out of the ordinary has happened since I last wrote. 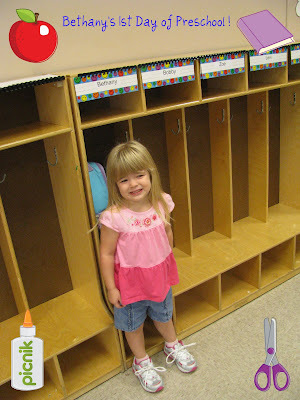 Bethany is half-way through her first year of preschool. She absolutely loves going to school everyday. She can't wait to get on her "morning clothes" right after she wakes up so she can go to school. Shelby's half-way through her 2nd grade year and is doing great. She received Good Citizen of the Week during the first month of school, was voted to be one of the representatives from her class for EACC, and just recently received a Citizenship award! So proud of my girlies. I take back the part I said about nothing much out of the ordinary has happened...Back in October, Adam had his gallbladder removed and is doing so much better now. It was getting to where he was having more frequent attacks and we never knew what kind of foods would set it off. He was really nervous about the surgery but he was in and out in no time with a pretty speedy recovery. We're so thankful to have that over with! Yum! Decorating Christmas cookies at Aunt Amanda's was fun! My lil angel Beth in pre-k choir at church. My little buggies at Halloween. Bethany did NOT want her picture take with the pumpkins. This was as close as I could get! The girls like to help me cook so Adam surprised us with these matching aprons. My friend, Melody from Simplie Girlie Designs made these and I thought she did such a great job! Last weekend we went on our first ever family camping trip. We went to a nearby lake, found our spot and pitched the tent. Let me tell you, it was sooo hot! We thought it'd get cooler pretty quick after the sun went down. That was not the case. We were hot, sweaty and it was very hard to go to sleep. I think our next camping trip will be when we have cooler temps. I'm not sure if that will ever happen though. It's been so hot for so long here. Bethany napped in the van. Then she snuck some Cheetos while Daddy was grilling burgers. Shelby told us a story about a Cowboy and Cowgirl. That girl has some imagination! You can tell we were HOT! Look how sweaty she was! Shelby and Bethany in front of the Visitor's Center. All in all we had a fun time. Next time I think I'd rather "camp" in a camper though. I just don't think I'm the outdoors-y type. I like a bed, an air conditioner and a SHOWER!!! Shelby and Bethany are having fun in school this year. 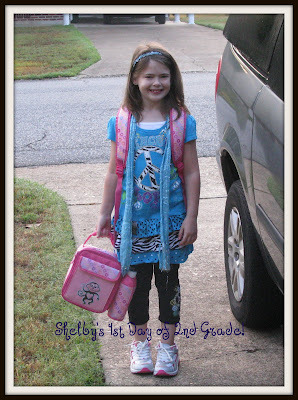 Shelby's already been Koality Kid of the week and is making good grades. Bethany is having so much fun with her friends. She learned about colors last week and brought a pink ducky to show and tell on Friday. Ready or Not...Here I Come!!! Shelby has a friend sleeping over tonight and all 3 girls were playing hide and seek. Adam helped Bethany find a hiding spot so that Shelby and her friend couldn't find her. The search for Bethany began. After a few minutes Bethany still had not been found. Adam yelled from the living room to Beth's hiding spot in the bathroom, "Bethany, be real still and quiet!" In reply she yells, "Okay!" giving away her location! It made us laugh so hard! So cute! !